2012 Eddy County NM Skywarn Operations. 2012 Midland NWS Spotter Training Class Schedule. On behalf of the Midland National Weather Service Office, Pat Vesper the Midland National Weather Service Warning Coordination Meteorologist, and Joel Arnwine the Eddy County Emergency Manager, I would like to thank each Skywarn Storm Spotter here in Eddy County for your help and dedication to our local Skywarn Program. Your spotter reports are invaluable to the National Weather Service, and are very much needed and appreciated. Thank you for your time and contributions to the program. I am looking forward to working with you again this year. Good luck out there and please stay safe. It has been awhile since we have experienced a severe thunderstorm here in Eddy County. This can be directly attributed to the ongoing historical drought that continues to grip the local area. Last year was uneventful severe weather-wise in Eddy County. My personal feeling is that this year will be different. I believe that we will see outbreaks of severe thunderstorms along and east of the dryline this spring, as it wobbles in and out of southeastern New Mexico. In fact this has already happened near the state line. 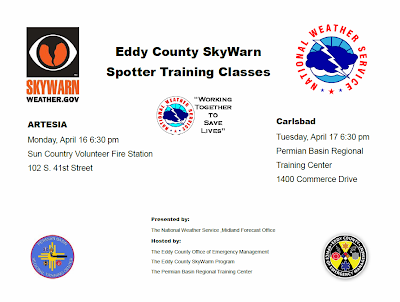 If it has been awhile since you have attended one of our local Skywarn Storm Spotter Training Classes, please consider attending one of the two classes scheduled (see the flyer above) in April. It never hurts to have a refresher course and see if there is something new you can learn. I encourage you to bring your family and friends along with you as well. Remember you can submit your spotter reports online via this link. Your information will go directly to the Midland National Weather Service Forecasters, and will be available to them almost immediately. For the past five years we have conducted a local Skywarn Amateur Radio Net here in Eddy County. This has been centered around our Amateur Radio Skywarn Spotters utilizing our local Amateur Radio Repeaters. Effective this year we will no longer conduct this local Skywarn Net here in Eddy County. I appreciate your help with our local Skywarn Net Control Operations over the past five years, thank you. Instead, all of our Eddy County Skywarn Amateur Radio Operators will be directed to contact our Regional Skywarn Net Controllers located at the Midland National Weather Service Office during Spotter Activation's. Spotter Activation's in Eddy County will be centered around a Severe Thunderstorm Watch, or a Tornado Watch that includes Eddy County. 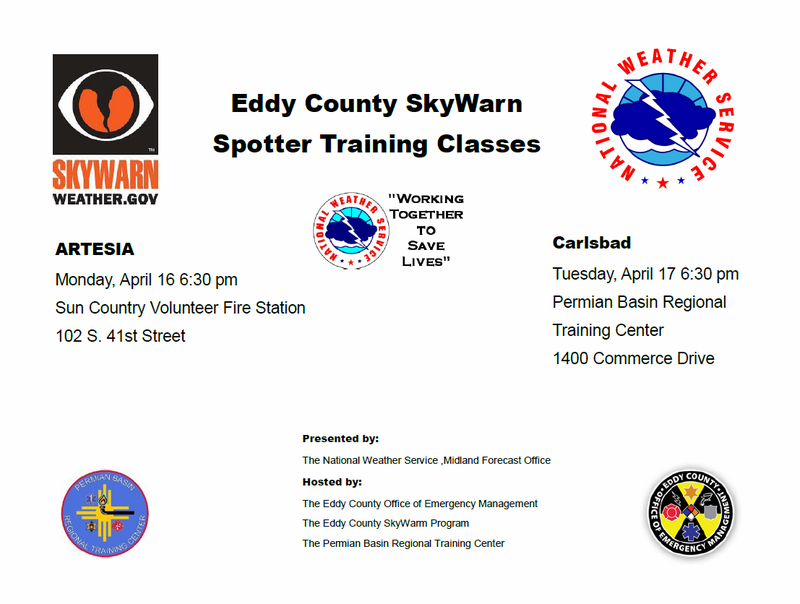 The idea is to bring Eddy County into line with the rest of the Midland National Weather Service Counties, who are already utilizing this process during Skywarn Spotter Activation's. All Eddy County Amateur Radio Storm Spotters are directed to please contact the Midland National Weather Service Skywarn Net Controllers during Skywarn Spotter Activations. For now please do this by using the West Texas Connection, via the Maljamar repeater ( 442.075), or the Dark Canyon repeater (147.120). I will email you on those days that Spotter Activations appear likely, notifying you to contact the Midland National Weather Service Amateur Radio Net Controllers. Their call sign is W5MAF. Remember, Net Control Operations will only be in effect during a Severe Thunderstorm Watch, or a Tornado Watch. Please submit a spotter report anytime you encounter severe weather here in Eddy County regardless whether or not you are able to contact the Net Controllers. Severe weather sometimes happens when Spotter Activation has not been called for. If you are unable to get into the West Texas Connection, then please give the Midland National Weather Service Forecasters a phone call, or submit a spotter report online. Five New Amateur Radio Repeaters. Eddy County now has in operation five new Amateur Radio Repeaters. These Repeaters are include: The Loop Repeater (147.280), the 12-Mile Repeater (442.450), the Queen Repeater (147.300), the Loving Repeater (147.360), and the Hope Repeater (147.380). Current plans according to Joel Arnwine, the Eddy County Emergency Manager, and I are to utilize these five new Repeaters as our principle Skywarn Amateur Radio Repeaters during Skywarn Activations here in Eddy County in the near future. Joel is working on tying these new Repeaters into the West Texas Connection. Once this process has been completed, I will inform you of the change. This new system of Repeaters is a great asset to Eddy County. I am looking forward to utilizing this new system during our local Skywarn Activation's. Please feel free to talk on these new Repeaters. Its important that we test them now, before severe weather arrives, to find out if we have any problems out there that need to be corrected. If you have any questions concerning these new Repeaters please contact Mr. Arnwine at 575-885-3581, or email him at jarnwine@eddyoem.com.